A creditor levied on my New Jersey bank account; is it safe to deposit money now? What to Do if a Creditor Levies on Your NJ Bank Account That letter from the bank can be a nasty surprise. A creditor has levied your bank account! What do you do? How do you defend yourself? Find out here! You get a letter or a call from your bank telling you that a creditor has levied on your account. The funds are frozen. Not only will checks bounce if they have not already cleared, but what will happen if you put more money into the account? What if you have direct deposit for your paycheck, and you are getting paid tomorrow? Will that money be frozen too? Well, the answer is, it depends. The amount of a bank levy is not the amount of money that happens to be in the account when the court officer shows up; it is the amount on the writ of execution he is holding in his hand. So let's say a creditor gets a judgment against you for $5,000. By the time it pays the fees and costs for the levy and gets a writ of execution to do it, the balance is $5,500. If you had $6,000 in the account at the time of the levy, then only $5,500 is frozen, and the remaining $500 is available for withdrawal. You could safely put more money in. The problem comes in when there is only $3,000 in the account. If your $1,500 paycheck hits the bank after the levy, that too will be frozen, bringing the levied funds to $4,500 on a $5,500 levy. the total amount on the writ. This will tell you if it is safe to deposit more money into the account. Just because your bank account has been levied does not mean that the creditor can keep all of the money. You may have defenses that could be raised before a judge that would prevent them from taking some, or all, of the money. Check out my free NJ Bank Levy Survival Kit to learn more! Want more information on how to fight back with your creditors? Then download my free book, The Biggest Secrets Your Creditors Don't Want You to Know. Become empowered and protect your rights! If you live in southern New Jersey and have had your bank account levied, and you want to retain me to object to the levy or negotiate a deal with the creditor, please feel free to call my office at 856-432-4113 or contact me through this site to schedule an appointment in my Woodbury office. The consultation is $200, but that fee will be applied to my retainer should you hire me. The sooner you take care of it the better! But if this bank levy is a sign of a bigger problem with creditors, and you are thinking that you might have to file bankruptcy, then download my free book, Am I In Too Deep? A Guide to Knowing When You Need to File Bankruptcy in New Jersey. What is a bank levy? What do I do if a creditor levies my bank account? Richardson Law Offices serves New Jersey, including: Gloucester, Camden, Burlington, Salem, Cumberland and Atlantic Counties and surrounding New Jersey communities, including Woodbury, Colonial Manor, North Woodbury, Woodbury Heights, Deptford, Thorofare, Gloucester City, Washington Township, Blackwood, Brooklawn, Westville and Pitman. 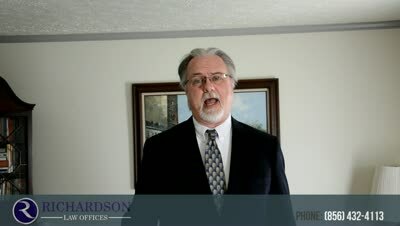 Bankruptcy, Collections, Student Loan, DUI and Traffic Court attorney in Woodbury, NJ. ?If a debt is charged off by a creditor, do I still owe it? ?What do I do if a creditor attaches my wages in NJ? ?What is a credit (FICO) score and how is it calculated? ?A creditor levied on my New Jersey bank account; is it safe to deposit money now? ?What is a NJ bank levy? Fill out the quick contact form below to schedule a case consultation. I hope you find my web site useful and informative, and that it answers your questions. However, you should know that this site's content is no substitute for a consultation with an attorney. Each person's case is different, and the pages on this site are designed specifically to provide general answers on New Jersey law and bankruptcy filings in New Jersey (and not for any matters outside New Jersey). For that reason, this site cannot serve as legal advice on your particular case, nor should you assume the existence of an attorney-client relationship either by reading its pages or contacting me initially by e-mail. I encourage you to contact me and schedule an appointment to come in. Let me give you a legal opinion based on your case that will help you specifically.